Snap up some last-minute treats without going into the red, with these top bargains. There are still a good few hours of Cyber Monday deals to go, and if you've made it thus far without succumbing to any hot deals then we reckon we might be able to twist your arm a little. Rather than parade a load of expensive gear in front of you, here we've collected together some of the best bargains available for under $50 or £50, so there's no excuse for not snapping up a sweet deal. 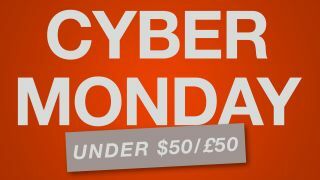 Don't dawdle, though – in most cases you'll only be able to take advantage of these Cyber Monday deals for the next few hours, so blow those moths out of your wallet and get shopping. Save $20: Get some Alexa in your life at a bargain price. This compact little device can play music, control smart home devices, provide information, read the news, set alarms and more. Save $15.00: Amazon's media stick is perfect for enjoying your favourite streaming services, and now it comes with accurate voice search courtesy of the Alexa remote. Save $20: Amazon boasts that its Fire 7 tablet is more durable than the latest iPad, making it the perfect tablet for little hands. This model comes with 8GB storage and up to eight hours' battery life. Save $10.41: Who can possibly resist a big pack of Sharpies for under $10? These art pens feature bleed-free ink and are perfect for hand lettering and detailed line drawings. Save $16.50: In a rush to get to work in the morning? Take your coffee with you in this insulated stainless steel mug; it'll fit in a standard cup holder and comes with a weatherproof clear lid. Save $40.00: Print out your photos the easy way with this compact wireless printer. It enables you to print from your tablet, phone or computer, and you can load it with up to 100 sheets of paper. Head to Target for this great price today. Save $7.50: When work's getting a bit much, kick back for some classic games action with this miniature Sega Genesis. It comes with 81 games - including all the Sonics - and two wired controllers. Save $12.00: Liven up your studio with some sounds from this Bluetooth speaker. Not only will it pump out the music, it'll also keep you endlessly entertained with its colour-changing abilities. Save $20.00: If your studio needs just a little more volume, then maybe this tower speaker will do the trick. Minimal and unobtrusive, it can bring the noise without getting in anyone's way. Save £15.00: It's another Amazon Fire TV Stick with an Alexa remote! It's the same product as above, with a similarly appealing price – because why should the US have all the fun? Save £13.50: Take your work with you anywhere, without having to wait for it to sync with your preferred cloud service - this memory card will hold up to 128GB of stuff and transfer it really fast. Save £40: This wireless mouse from Logitech can be paired with up to three devices, its laser tracking means it'll work on any surface, and it'll last 40 days on a single charge. Plus, it looks amazing. Save £30.00: With 16GB of storage and up to 12 hours battery life, the Fire HD 8 is available in an assortment of colours and it's the ideal bargain alternative to an iPad. Save £15.00: Again with the Echo Dot, soon to become a star of many viral videos, we're sure. Ask it anything and it'll do its best to find an answer. Amazing. Save £14.00: This wireless keyboard comes complete with a touchpad, making it suitable for using with any devices around your studio and home. Save £50.00: This high-quality inkjet colour printer is ideal for printing from any device, and it'll scan and copy too. It boasts easy-to-use controls and a colour display screen, all in a compact space-saving body. Save £29.99: Designed to be the perfect travelling companion for any commuter, this backpack features a padded compartment for laptops up to 15.6-inches across, as well as plenty of extra room for all your other gear. Save £10.01: If you're not tempted by an Echo Dot or Fire TV, maybe Google's Chromecast would be more up your street? It'll do iPlayer, Netflix and more, as well as mirroring content from your Android device or Chrome browser. Save £11.00: Got a load of data to move around? This sleek portable hard disk from Seagate will hold up to a terabyte, so you'll be hard pushed to run out of space. Save £39.00: Bang out some tunes in style without annoying everyone else, with these impressive Marshall cans. They'll provide you with amazing sounds, looks and durability, and they'll adapt to your head shape for maximum comfort.